As we move towards generational parity, there has been a substantial shift in ideology and perception towards savings and long-term financial planning. The millennials are getting their feet wet, delving into investments for greater financial freedom, while the baby boomers and Generation X target wealth maximization and preservation, thus altering their investment strategies. Understanding the risks involved before investing, and how to mitigate losses could fast-track the process of achieving your investment goals. This is only possible through a proper investment strategy which guides you through the investment journey. An investment strategy acts as a manual, enabling you to choose and opt for the best investment plan depending on your profit objectives and timeframes, and provides you with the risk-reward potential of your investments. A key component of low-risk investment lies in its diversification. A diversified portfolio entails investing in a number of different investments, which greatly reduces the risk component, but could also result in relatively low returns. Diversifying across bonds, cash and stock funds enable you to steer clear of incurring substantial losses, given the market volatility. Short-term investments are typically made while taking specific profit objectives and timeframe into consideration and are low-risk options while giving modest gains. This investment strategy ensures minimum risk, while the returns vary depending on the type of investment. 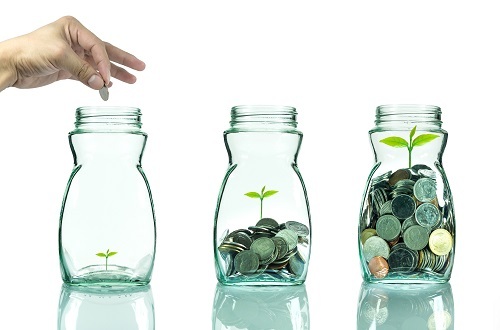 Online savings account, certificate of deposits (CD) and money market accounts are some of the examples of short-term investments, which prove to be beneficial for individuals looking to invest their additional cash with minimal risk. The idea behind value investing is fairly easy to comprehend and needs a greater understanding of the nuances of the stock market. In value investing, investors find underpriced stocks through rigorous research and understanding the growth potential of companies, and buy stocks which are cheaper than they are expected to be. Value investments tend to take a long time before showing promising returns, and the ‘buy and hold’ strategy requires patience and willingness to hold on to the stocks during the market fluctuations. Income investing enables investors to build wealth over time and involves putting together a collection of assets that could generate high annual income at a low risk. Securities are bought that tend to pay out returns steadily, such as bonds, dividend-paying stocks, mutual funds and real estate investment trusts (REITs). Furthermore, fixed income investments could provide a dependable income stream at minimal risk. The process involved in growth investing is similar to value investing, but instead of applying ‘buy and hold’ strategy, growth investment focuses on capital appreciation. Companies that show signs of above-average growth are zeroed-in by looking at their profits and revenues, and while growth investment is attractive for investors because of its potential for high returns, it is a relatively riskier strategy. The other alternative could be invested through systematic investments plan of a mutual fund. The small-cap investment includes purchasing stocks in small companies that have a relatively smaller market capitalization. These companies could be either start-up firms or are in their development stage. This type of investment strategy involves a higher risk but is attractive to the investors because these companies go relatively unnoticed. Furthermore, considering the market volatility, the small-cap investment strategy is for the more experienced investors. Depending on an individual’s profit objectives, timeframes and skills, an investment strategy can be designed, which is used to guide the investor’s selection of an investment portfolio. While understanding the nuances of the stock market is still important, investors now have a plethora of options to choose from, steering them onto the path of financial freedom.